No Trump rant today, I promise...but there will be more in the future, so anytime I post something you find offensive, politically or otherwise, I'll understand if you opt to skip those posts. We're all entitled to our opinions, and the expression of them. But the only way to maintain friendships in the face of such strong differences is to not respond to those with whom we disagree. No debates, no statements, nothing. That's why I learned to not get confrontational with friends who did vote for the...well, you know. Most of my friends, fortunately, do the same--though I have had to cut a few Facebook friends loose. 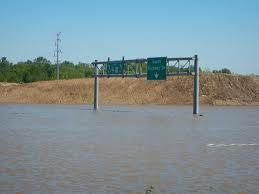 Currently, we're dealing with flooding in our area--some of it pretty close to home. 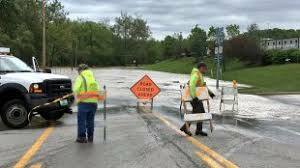 Several roads and interstates have been closed. Fortunately for Collin and me, we both work at home. 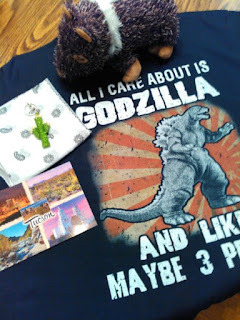 A few days ago, I received this wonderful gift box from my blog buddy Gayle at Two Little Square Black Dogs. As Collin and I started preparing a gift box for Gayle, we came up with an idea. 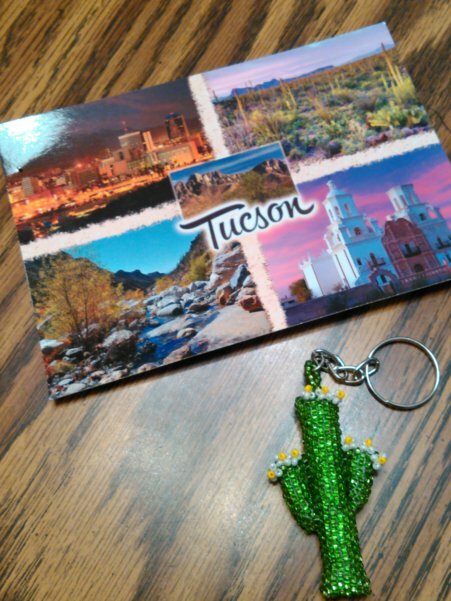 Two of the items Gayle sent were a key chain and a postcard from her city, Tuscon. 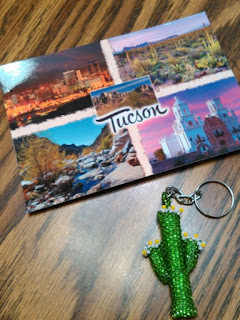 If enough of you are interested, I propose we send postcards and key chains representative of our cities/towns to everyone else who participates. Normally, I wouldn't say anything. We've had presidents I didn't vote for, but the world didn't come to an end. This time is different. 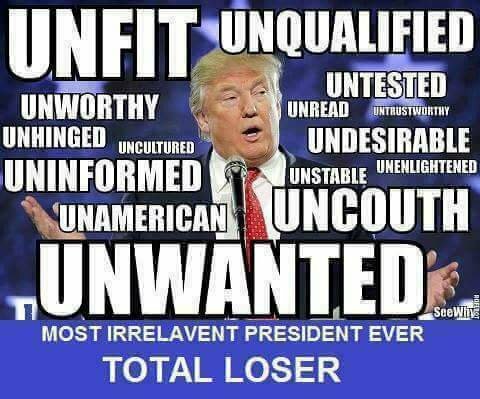 Trump is incompetent on more than one level. He talks and acts like a child. 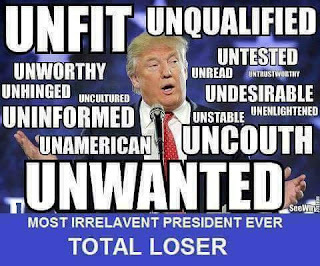 He still holds campaign rallies because they feed his ego. He throws Twitter tantrums at any perceived slight. Instead of filling his cabinet and staff with people who compensate for his laundry list of shortcomings, he hires his equally unqualified family members and others who do more harm than good. He will use any opportunity to brag about himself. He and his family treat the US Treasury like their personal ATM. He claims the government can't afford programs to take care of the elderly and poor, provide healthcare for everyone or pay Social Security, but there's plenty of money to pay for extensive Secret Service protection for his grown children--traveling on Trump business. And he's managed to alienate many of our allies. Now, he's trying to start a war. I'm not Democrat or Republican. I don't agree with either party's platform 100%. And I think some from both sides take things too far. I refuse to debate because thibg tend to go too far, and I lack patience. This is why I stick to my own blog, social media pages and like-minded groups. And why I'll block anyone who pushes me too far. Crap! That was supposed to read: "things do tend to go too far..."
It's been flooding here in places in the Ottawa Valley, but not as bad as there. How do you like your new place so far? I had a small project a few years ago. Send me a postcard I will send you one back. It was fun but not many did it. The markets all have postcards and you can buy stamps. So easy and so nice to see something besides flyers or bills in the mail. My summer post cards usually say.... Hot as hell, pool open come on down ! awww happy you liked your javelina. thehamish is happy you named him Hamish ! Pool party at Gayle's, everybody! It seemed appropriate to name my little javelina after Hamish. I always try to pick special names for my plush! This is one of the things that I love about blogging and that's the friendships and connections that we make with other. So. Much. Fun. PS: Sorry you had to drop some FB folks. It is fun. As for the loss of friends on Facebook, some people just don't know when to back off. Good point and really, people like that are just clutter. I don't know... should we build an arc, now? Up here, we kept getting rain, but not as bad as those just south of I-80, or there abouts. I have no problem with people posting about their feelings, thoughts and such. This is your blog, Norma, you have the right to free speech and really, some people should just get over themselves. If I don't agree with something in a blog, I simply don't respond, or read it. How simple would the world's problems be if people would just turn the other cheek and not make a big deal out of what other people think? It feels like an arc is called for, doesn't it? I can say that most of my friends feel as you do about our rights to our opinions. But there are always a few who just can't resist the opening to challenge someone else's position. There's one woman at my church who's been sticking her nose in my business since the day I met her. I tried to ignore her, but reprimanding me on Facebook page over a political post was the last straw. 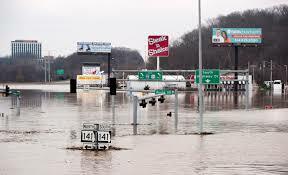 Rant all you want about #45 Norma, I'm totally with you ☺ I've been seeing your floods on the news, incredible! I'm wondering why people still build their homes in floor areas, it does happen on a regular basis? He's an embarrassment, for sure. The world is fortunate that France, whose citizens are far better educated than ours, kept a fool out of their highest office. I love the postcard idea. Count me in! I think it could be fun, if we get enough people together!